You need to play in order to work, but also work in order to play. Getting to know one another doesn't happen at first glance or superficially, it requires time, perseverance and potentially sweaty situations. Work work work work work work is such a situation, where together you will face your common enemies deadline, blank canvas and peer pressure. People will flourish, win, lose, lead, listen and possibly cry, but it is all for the greater good. To get to know somebody you did not know. Work work work work work work is an afternoon working-session — first performed at Kunstvlaai 2017 — between different disciplines and different people where the creation of open ideas is key to take home a €512 micro-fund. The session is led by both a moderator and an algorithmic system. It is a performative installation which functions as an alternative to professional speed-dating sessions. 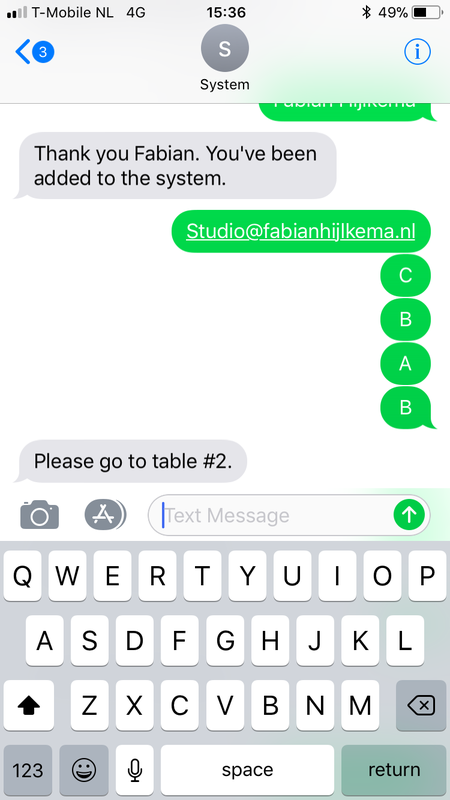 An algorithmic program called System communicates with a room full of people through its large display and by sending the group personal text messages. Each individual can also answer questions by returning text messages to System. The goal is to have people work together in smaller groups in order to produce an intensive couple of hours where people start to get to know one another. To come together and present a coherent plan and concept they need to discuss, question, fight and of course just talk about their (common) interests. The formulated plans and concepts are presented to the other groups after which the room is shuffled, and the process reiterates to sharpen up the presentations. At the end of the session all the ideas are presented once more, and a collective vote determines the winner. Depending on the given answers, people will be matched unto tables. As a result of the first instance of Work work work work work work — performed at K_nstvl___ 2017 — a mobile kitchen has been built that acts as a container for conversations, parties and performances.